Typically, most of the consumer PC platforms are fully operable in room temperature. In order to cater for the industrial and embedded markets, VIA Technologies, a Taiwanese fabless chip maker has just announced a new Nano-ITX based platform that is capable to run in extreme temperature environment from -20 up to 70 degree Celsius. 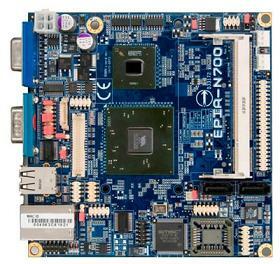 The new platform, codenamed as EPIA N700-10EW is powered by VIA Eden ULV processor running at 1GHz. Further coupled with its famous VX800 all-in-one media system processor, it offers an excellent hardware decode capabilities for various formats such as WMV9, VC1, MPEG-2, MPEG-4 media playback, freeing up CPU cycles for other tasks processing. Other interfaces include commonly available USB 2.0 host ports, PCI Express, SATA, Gigabit Ethernet port, Compact Flash slot as well as VGA port for external display. And in order to make it fully functioning in extended temperature, all the discrete components selection have been carefully made that can withstand extreme temperature for much more reliable system under any condition. Regardless of all these great feature sets, the fabless chipmaker has managed to pack everything into a tiny 12cm X 12cm form factor, not to mention about the relatively huge SODIMM memory slot that used to hold the 2GB memory module. Surprisingly, no active fan is required and so the platform can be used in any fanless applications, that makes the design much more flexible in concealed space. No pricing information yet, the new platform is expected to reach embedded market soon targeted for industrial and vehicle infotainment usages.